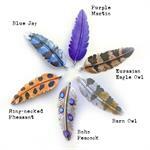 These feather pendants are medium in size. 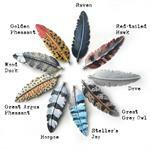 They are approximately 18mm wide by 55mm long, or 3/4" inches wide by 2-1/4" inches long. The photos in this listing include a ruler so you can see how big the pendant is. The top loop is 2mm in diameter. These scarecrow pumpkin pendants are large-ish in size, they are approximately 2-1/4" inches wide by 2-1/4" inches long. There is a 6mm loop at the top of the hat for a jump ring. This painted squirrel pendant is large, it is approximately 2-5/8" inches long by 1-1/2" inches wide. There are two loops for easy attachment, one on each side of the pendant - the inside diameter of the loop is 2mm. These turtle pendants are medium in size, they are approximately 1-5/8" inches long by 1" inch wide. This pendant is small, it is approximately 40mm long by 13mm wide, or 1-9/16" inches long by 1/2" of an inch wide. 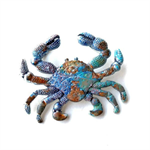 These crab pendants are large in size, they are approximately 58mm wide by 48mm tall, or 2-1/4" inches wide by 1-7/8" inches tall.